Several weeks ago I published an article asserting that China has surpassed Japan in box office revenue and is now, on a week-to-week and month-to-month basis, the 2nd largest theatrical market in the world after the United States. I forwarded this article to friends and acquaintances at several publications, including “The Los Angeles Times,” “The Wall Street Journal,” “The Wrap” and “The Atlantic Monthly.” To my disappointment and dismay not one of them picked up the story. I suspected that they and others doubted my figures were correct. Over lunch in early February an acquaintance who runs international production for a major Hollywood studio confirmed my suspicion. He said he’d spoken with several of his executives and they told him that the numbers I was relying upon were wrong. So I went back and double-checked my figures, and during the past few weeks while traveling in China I conducted further investigation. Having carefully studied the data and having interviewed a handful of experts in China, I must report that the studio executives were right, that my numbers were off. But not in the way they think. My numbers for China, it turns out, were low; China is ahead of Japan by an even wider margin than I had thought, and it has been ahead for quite some time. One major reason for the discrepancy is that I had failed to take into account China’s massive box office skimming. As I reported last week, according to most of the experts I consulted, as much as 40 percent of movie ticket revenue in China never makes it back to its rightful recipients, the distributors. If the ticket sales don’t get reported then they’re not captured in SARFT’s official figures, and so SARFT’s figures are too low. But even if we disregard the skimming and rely on official figures—after all, the number that distributors care about is the amount that goes into their coffers—China still easily beats Japan by virtually every measure. 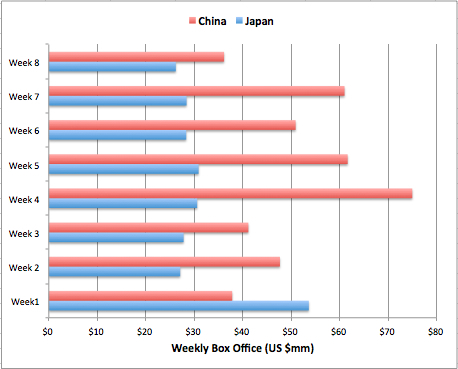 Comparing officially reported weekly box office results, China beat Japan in 7 of the first 8 weeks of 2012 (it also beat Japan in each of the last 3 weeks of 2011). All told, China’s total gross for 2012 so far is 64 percent higher than Japan’s, at US $426 million vs. US $259 million. If skimming was indeed equal to 40 percent of gross receipts last year, then China’s real box office total for 2011 would have been close to US $3 billion, far ahead of Japan’s reported $2.2 billion. While there may be some under-reporting in Japan, it is almost certainly modest compared to China’s, and there is little doubt that China has been out-grossing Japan for several quarters and possibly longer. And why shouldn’t it? China now has more than 10,000 movie screens, with the number increasing daily. Japan, on the other hand, has only 3,400 screens and virtually zero growth. China’s box office for the first 8 weeks of 2012 was up by 49 percent relative to the same period in 2011; Japan’s was down by 3 percent . Most important to those Hollywood studio executives I mentioned is how their own films fare in each market. And by this measure there’s no contest: China beats Japan hands-down. Each of the last ten Hollywood films to play in both markets earned more in China than in Japan, in most cases a lot more. 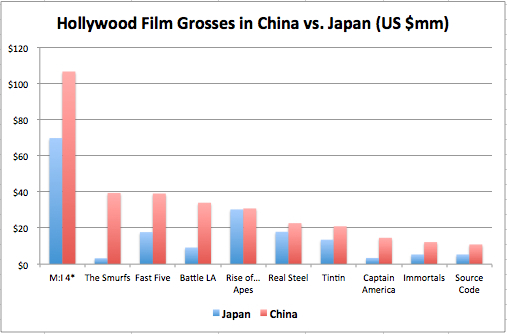 The aggregate gross for the ten films in China was US $330 million versus $175 million in Japan. 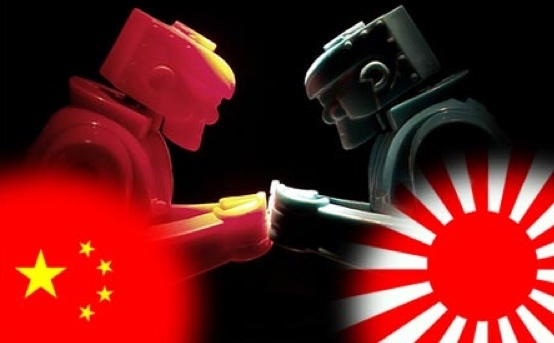 Assuming that Japan continues at its zero-growth pace for the rest of this year, and that China reaches $2.8 billion in officially reported revenues, the actual, unreported totals for 2012 would put China at $3.9 billion (2.8 billion plus 40 percent) and Japan at $2.2 billion. So the question of whether China is bigger than Japan has been long settled. The real question now is how long it will take China to catch up with the U.S. It will happen faster than most realize, and when it does it will be too late for many to do much about it. This entry was posted in Analysis, Box Office Reports, General News and tagged Adventures of Tintin, Battle Los Angeles, box office skimming, Captain America, China box office, China vs. Japan box office, Fast Five, Immortals, Japan box office, Mission Impossible 4, Pacific Bridge Pictures, Real Steel, Rise of the Planet of the Apes, Rob Cain, Robert Cain, Smurfs, Source Code by chinafilmbiz. Bookmark the permalink. How do foreign films get their box office returns out of China given it’s extremely difficult to get money out of China other than on a personal level where there is a limit of US$50,000 a year? I’ve produced 10 projectst in China over the past 20 years and as you will know, if you get a Chinese investor for a film there’s no point in getting investment greater than the China spend as the funds can’t go out of the country without great difficulty. A foreigner/foreign company can’t open a bank account in China unless they have an office there and that requires government approval plus substantial costs before you get near to the stage of opening a bank account! Is there a way I haven’t found yet? You raise an important question. It’s still a challenge to convert rmb into hard currency. There is a market for changing rmb into hkd, and recently China has opened up the market for Yuan-Yen currency exchange. I’ve only done this a few times, and it usually involved pulling strings and calling in favors to get my dollars out. I’m curious to know whether others can speak to this issue. Thanks for the response Rob. It would be interesting to know how/if films like ‘Avatar’ and ‘Kung Fu Panda’ got their box office returns out of China. Whilst companies are rushing into multiple picture deals via joint ventures, letter of intent, et al, I wonder if they’ve taken on board that each single film nevertheless has to run the government’s co-production gauntlet including script approval before they can even get the appropriate visa to get into China to shoot a frame. Plus the Chinese government has final censorship rights on each film and there can’t be separate versions for China and another for the rest of the world. Then there’s the question of the legal status of non-Chinese film industry contracts in China where a contract ain’t a contract in the same way it is in the West. There’s little to no security for foreign producers even with a contract signed by both the Chinese and non-Chinese co-producers in the event of difficulties. I really enjoy your articles and blog on the Chinese film industry Rob. You’re providing excellent information/discussion for anyone thinking of entering the Chinese film area. Hasten slowly I say….it has a whole new meaning in China! Thanks, Lesley, your feedback is appreciated!